When space is limited and you desire a different look with your bed, get creative and make your bed look like a couch. You can easily turn a basic twin bed into a quasi-couch with only a few artfully placed pillows and a little rearranging. After you remake your bed so it looks perfect for lounging, you can have company who can sit comfortably in your imaginative and ingenious sitting area. A twin bed can transform into a couch easily. 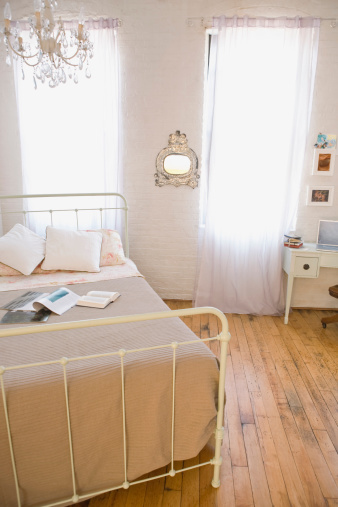 Push your bed against two walls (into a corner) so one long side and one short side of the bed sit snugly in the corner. Place the bed skirt beneath the mattress so it reaches the floor, hiding the legs of the bed. Arrange the bedspread over the top of the bed so it overlaps the bed skirt. Measure the perimeter of the two short sides and one long side of your bed with a tape measure. Use this measurement to choose your bolster pillows. Purchase four bolster pillows that will stretch across the distance of the three sides of your bed that you measured. You need one bolster pillow to sit along each short side and two bolster pillows to sit together along the one long side. Place strips of the hook side of the hook-and-loop fastener along both short sides and the long side of the bed. Because the fastener strips are self-adhesive, simply peel away the backing and position the strips on the bedspread approximately 3 inches away from the edges of the short sides and long side of the bed. The fastener strips will hold the bolsters in place on the bed. Remove the backing on the loop side of the fastener strips and place these strips onto the bolster pillows, stretching the strips along the pillows from end to end. Position the bolsters onto the bedspread, attaching the hook side and the loop side of the fastener strips together to hold the bolsters in place. Add a few extra throw pillows onto the bed to make it look more like a couch.